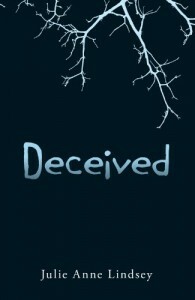 This novel turned out to be an interesting romantic story. It included the right amount of suspense and thrill as well as romance. Also surprised me who ended up being the villain considering I'm used to novels making the villain more important and/or closer to the main character in some way or another. Julie really made this romantic/suspense novel different from most I've ever read, and for that, it deserves a 4 star rating. I was originally only going to give this book 2 and 1/2 stars, but I decided to give it a chance and it really surprised me. Mostly because I also read Lauren Oliver's Delirium and I ended up not liking it as well as I did the movie adaptation of it, so I decided not to pursue reading the entire trilogy. That made me kinda iffy about this work of hers, especially considering I'm usually not one for competition-type novels, but she wrote this book pretty well. 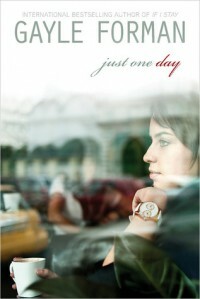 Isn't the best book I've ever read, but it was okay! I liked this novel because it was in Willem's point of view, and so you got to see what happened with Allyson aka Lulu through his eyes and mind. In a way, it reminded me of the If I Stay series just because like that series Gayle did the 1st novel through the girl's point of view than with the 2nd the guys. Liked how with Willem's point of view, you learned that what went through Allyson's mind with what happened wasn't the whole entire story. 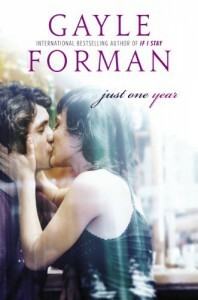 Also loved that Gayle managed to interpret Adam from If I Stay into this novel with Willem liking Adam Wilde's music. Only thing I managed not to like was, it took the book forever to finally pick up where the 1st novel ended, and by that time there was only a few pages worth of what happened after. Other than that, I liked Willem's story, so it was a pretty good read! I really enjoyed this novel, mostly because it was a very cute love story in the beginning. But, like how life goes, the good started turning for the worst for Allyson(Lulu). I was kind of iffy about the whole 'girl meets guy and falls in love with him in a day' thing. It turned out to be interesting enough though. I think Allyson was a great character, just because she was strong enough to leave and try to live her life without Willem. But, I think Gayle's point of this whole novel really showed through, and that was, you never forget your first real love, no matter how hard you may try. In my honest opinion, I think this book would make a good movie, either in the theater or on Lifetime. Highly recommend this, especially if you enjoyed Gayle's other novel, If I Stay. It certainly took me a while, but I finally finished the last book in the Divergent trilogy. In the beginning, it was somewhat boring,(Which is why I deducted 1/2 stars) but I knew since it's Divergent, it would get more interesting. And interesting it did get! I loved how they switched back and forth between Tris and Four's point of views, it really let you see into Four's mind and how he felt and what he thought about everything that was happening. It had about the same amount, if not more, of violence as Insurgent did. I was definitely not expecting a certain person who died in the end to die, and I think that's why some people didn't enjoy this last book. Some people just don't like surprises. But me? 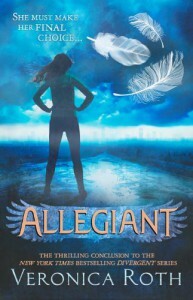 I love them when it comes to stories, and Allegiant certainly had the surprises. While I was reading it, the message that came across to me was this: No matter how much pain you endure in life, you can't let it control you and take over completely. You have to eventually learn to forgive and forget, and let go, and continue to live your life. To me, this was the best book in the whole trilogy, and I can't wait to see how they incorporate it into a movie. I am now reading the final book in the Divergent series. So far, it's been pretty uneventful, but considering I've read the other 2 novels, I know that won't happen for much longer! I also happen to love that they do the whole point of view(POV) switch off between Tris and Tobias/Four throughout the book, makes it more interesting. I've heard so many mixed reviews on this and Allegiant, some say their not as good as Divergent, others say they are. 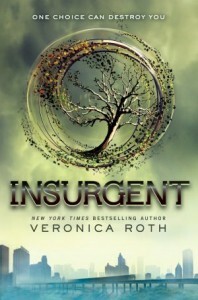 My opinion is, I honestly liked Insurgent slightly more than I did Divergent. (If I could give 5 and 1/2 stars I would). It lets you learn even more about the depth of the characters. Who they are as a faction and where they come from with their families. There's a lot more action in this, than in Divergent also. I was slightly surprised with the whole Caleb thing, so that was an added bonus. I hope they do the book justice when the movie is premiered, hopefully they'll follow the story as much as they did with Divergent. The way this book was written completely blew me away. The fact that the movie compliments the book so well was also fascinating. I'm glad I watched the movie before reading the book. I'm not much of a trilogy person, the last I read was The Hunger Games. Divergent is just as good, if not better than The Hunger Games in my opinion. Good read, can't wait to read the other 2 novels in the trilogy! 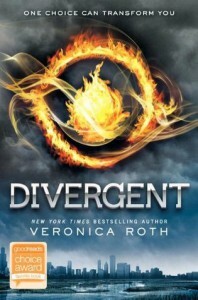 I'm currently reading the Divergent series. I've seen the movie, and I enjoyed it, so hopefully I will also enjoy the novels! 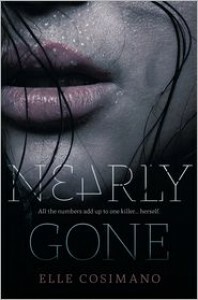 This was another novel that I couldn't hardly put down, and I don't get that way very often. It had just the right amount of suspense and content that kept your attention throughout. I honestly didn't expect the culprit to be who it was in the end, it certainly shocked me to learn who did all the murders. I'm lucky to have found such a great book, and while you're reading it, you wouldn't even be able to tell that it was the authors first novel. 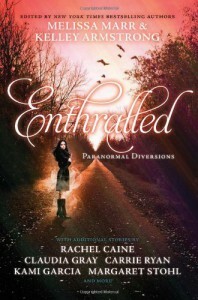 I highly recommend getting this book if you love suspense! I know I haven't been on BookLikes for a few days. The reason being, I was feeling very sickly, but I'm feeling much better now, so expect some more reviews from me!